I’ve had a couple people ask me why these two shows did not appear on my Things That Need to Go in 2011 list, and it’s because first of all, I didn’t really think of it until after press time and there were so many possibilities to choose from. So we’re at the compromise of another edition of Things Everybody Else Loves That I Hate. If you haven’t seen either show,don’t worry, they’re kind of the same show. It chronicles the lives of young teenage mothers and their struggles of caring for a baby at such a young age. Allegedly this show was to be a way to show young people who are watching that having a child at that age is probably not a good idea. However, this theory is becoming diminished . In a story written by AOL’s Rob Shuter http://www.popeater.com/2010/12/07/teen-mom-pregnant-auditions/, MTV is looking for a new crop of teenage mothers to cast now that some of them are getting into their 20’s and that young girls who are eager to get on reality TV are getting themselves pregnant in order to get chosen to appear on the show. 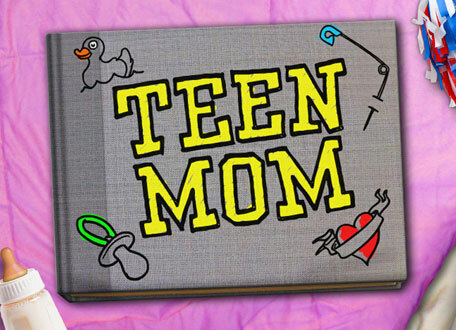 Fortunately, the talent pool is very small, but it makes me wonder if it’s going to grow because of shows like 16 and Pregnant and Teen Mom, it makes me wonder if these shows are encouraging teen pregnancies in the name of profit for MTV and it’s parent company,Viacom. At first I didn’t think that it was doing that, but now I’m kind of wondering if it is, and if so, then that it shameful. Yes, it’s the fault of the young ladies that they got knocked up in the first place, but I know young people, and young people are influenced by a lot of what they see on TV, the internet, and in print ads as well as what they hear on the radio. If these girls think getting pregnant is their way to get somewhere in life, they are sadly mistaken. And most of all, why would any young person with a brain in their heads go this route? Is that how desperate people are to be famous? To ruin their future’s in order to maybe be on TV. Because as a friend of mine told me the other night,there’s no guarantee they’ll even get on the show and they’re stuck with a child they shouldn’t have had in the first place. I think it’s fine if any young women who is old and enough and mature wants to have a child,that’s all fine and wonderful, but do it for the right reasons and at the right time. Don’t get knocked up by some guy who may or may not even be their for you in order to be on TV,it’s ridiculous. I don’t know if this show should go, I don’t care for it much myself,but if it’s now purpose is to exploit young women by having them get pregnant and throw their futures away, then yeah, this shouldn’t be on TV.